(33) Continue on the other side of the Worthing Road, to the left of Office Outlet (was Staples) store, and after the footbridge turn right. Follow this path with the river on your right (34). 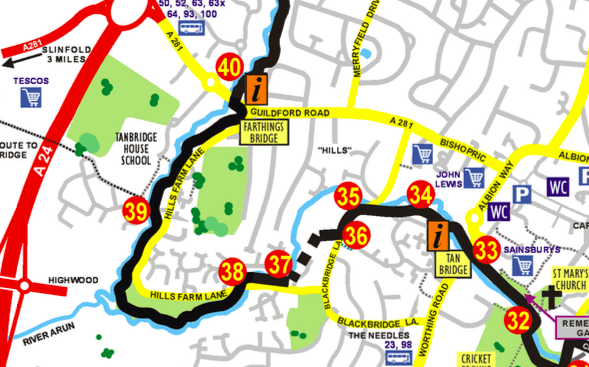 Go left into Blackbridge Lane (35) and turn right, past the school, into Arunside (36) . At the end of this road follow the path going left, past a seat and across grass, with the river on the right. Continue to Shandys Close and then turn right into Hills Farm Lane (37). Turn left after the bridge (38) onto a path that rejoins the riverside for some way. Cross The Boulevard (39), and follow the path up to Hills Farm Lane again. Turn left and follow this up to Guildford Road passing Tanbridge School over to the left. Turn left and use the pedestrian crossing to continue on the other side (40). (40) Use the pedestrian crossing on Guildford Road to go down Hills Farm Lane, passing Tanbridge School over to the right. Cross The Boulevard (39) and continue with the river on the right for some way, and playing fields on your left. On reaching Hills Farm Lane (38) turn right, over a bridge, then left into Shandys Close (37). 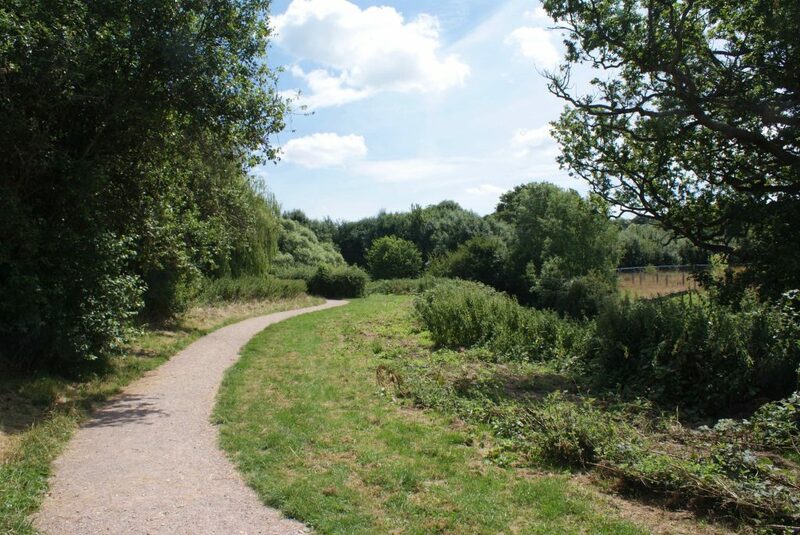 Follow the path across grass with garden fences on the right. When reaching a 'No Ball Games' sign turn right into Arunside (36). Walk up to Blackbridge Lane (35), turn left and after the Primary School turn right into Blackbridge Court. The path continues through an alleyway on the right to rejoin the river (34), eventually going left over a footbridge to come out next to Office Outlet (was Staples) store and onto the Worthing Road (33).